You got this! Coach Chuck Sayler coaches the team during their game. Sayler then gave another pep talk during half time. The ninth grade boys’ basketball team is making no progression at the games this 2017-2018 season, for their record has decreased in the amounts of losses to wins ratio. However, seventh and eighth grade boys are making strong progression, for their record ratio has increased. 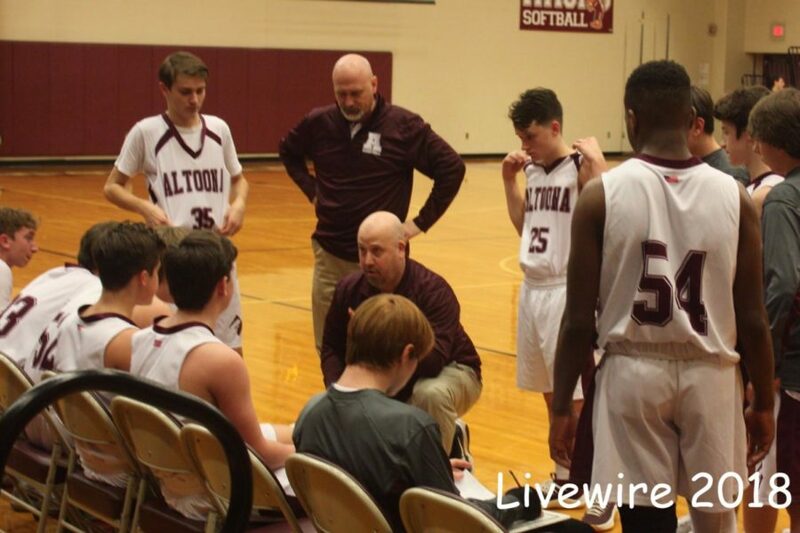 The ninth grade boys are at a record of four wins and nine losses. The seventh and eighth grade team are at a record of seven wins and one loss. Connor Whysong, a seventh grade basketball player, made the basketball team for the 2017-2018 season. “I know we’re doing pretty good, but I think we could work on rebounding and passes,” Whysong said. Whysong played all through elementary but thinks it’s different in the junior high. ” I think it’s way different because in elementary you don’t try out, and it’s kind of free ball. You have to learn plays and do your best on the court. It’s not all about having fun, you have to put effort and hardwork.” Whysong said. Whysong plans on playing all through his high school years. Mehki Perez, a ninth grade maroon basketball player, plays small forward. “I would rate the intensity a .8. Dubois wasn’t that good. Honestly, we should’ve put 80 on them,” Perez said. Perez was very confident going into the game against Dubois. “No, this year we weren’t intimidated, so we just went in there and did our thing,” Perez said. Perez believes that the Mt. Lions are a far better team than Dubois. Jake Corso, ninth grade basketball player, has been playing basketball since he was in first grade. “I would say it’s around a four kind of intensity level because we had the lead the whole game and our defense was locked down. They had turnovers and they couldn’t score on us,” Corso said. Corso plays center and is 6’2”. Scott Berardinelli, the ninth grade maroon coach, brings experience to the job. “I have been coaching basketball for 4 years, soccer for 4 years and I had previously coached junior high football for 9 years. I coached high school football for 3 years at another district as well,” Berardinelli said. Berardinelli believes that his boys are doing great this year but believes some improvement could take place. “The progress of the season thus far is good in the perspective the kids are staying focused and working hard even though the team is struggling to find ways to win. The kids have really progressed fundamentally but just haven’t managed to put it all together on a consistent basis,” Berardinelli said. Ninth grade boys are connecting really well with each other, Berardinelli believes. “The team’s skills are improving on the basis of fundamentals but they came to me needing a lot of work on the basics. Our seventh and eighth grade coaches do an excellent job but when kids come to us from the elementary programs they have already learned bad habits and need correction and sometimes that takes years to break bad habits,” Berardinelli said. Berardinelli tends to repeat certain drills at practice to ensure himself the boys have it down. “I constantly state to the boys to keep playing hard and focus on the little things and the wins will come. We do a lot of the same things in practice so the kids can learn to do things right and on a consistent basis,” Berardinelli said. Austin Beauchamp, seventh grade maroon basketball player, generally is a guard. “I think we’re doing good, I mean we’re winning. We’re doing pretty good, and we’re winning by a lot. We work pretty well together and that’s the key to success,” Beauchamp said. Beauchamp is satisfied with the team’s record. “We’re at a record of 7-1. It could be better if we’re undefeated but we’re satisfied,” Beauchamp said. Tysen Larocco plays basketball for the seventh grade maroon team. “Yes, basketball stands out from any other sports because it is a lot of fun and hard work,” Larocco plays forward and center. He plays forward more than he plays center.